Thanks for laying down the law Boss. I absolutely agree with everything Elric said. I did decide to help you out though Dell. I'm pretty sure this is the sprite you meant and I picked out a decent gray for you and left a few examples for you, should be easy to finish. I'll also give a few tips i learned in tutorials and from my own practice. In Tactics we are limited to 16 colors per palette, and 1 of those has to be the background color so really it's only 15 colors. Another color is usually a very dark shading so more accurately 14 colors are freely usable (although the shading color can double with black as I did in my Ninja Malek, hardly noticeable). In Tactics you'll notice most characters have blond hair and light skin. That is because their hair and skin share some colors to compensate for the color limit. In this sprite you'll notice that to change the hair color I had it share colors with the armor. In a few poses the shoulder pauldrons touch the hair, so i made small edits to keep them more distinct from each other. I also didn't touch the portrait, but let me warn you that portrait and sprite body colors should never be the same. If you want help finding colors for the portrait pm me, keep it out of this thread please. I'll also say that to add extra color you can probably cut the darkest red and recolor those parts with the shading color, you can likely also cut one of the less-used skin/old hair colors. Lastly I'll say that I use an awesome app called Graphicsgale for most of my edits so far. Just Google it. And again to emphasize Elric's point to try learning yourself like I am. Check in the tutorials and best of luck! You can also use Xif's 'Palette Editor' program to change colors from the palettes very easily. Okay so update on that unfinished sprite i was talking about. Started working on it yesterday and i don't have too much but I'll share it anyway. The sprite i'm fixing/finishing was started by Rfh and the last update I'm using as a base is in this post. A hearty thanks to everyone involved in doing the hard work for this sprite! At first glance It isn't too far from completion and looking in Shishi the animations look really spot on! (to me anyway) So I'm a bit sad I won't have serious body proportion or positioning work to do. What it does sorely need is a severe palette reorganization, fixing many wierd design choices like eye/highlight color mixed in skin, skin color mixed with wings and clothes, the chest region being...well just bizarrely colored, a lack of any dark shading color, unfinished portrait, the list goes on. So I'm cracking my fingers to fix all these. I'm liking these 2 new palettes (1 and 3. palette 2 is a touch up of the original but I'll change it). I finished the top row and then some. Here are the results vs the original. Not much i know, but how's it looking so far? Thanks Elric Yes the palette looks horrid in the version i downloaded as a base. My only guess is someone must have changed the color depth or some tomfoolery made Gg condense the colors in that bizzare order. Either way when I'm finished it'll all be nice and neat, easy to customize. I had an idea to possibly add another shade to the dress so my palette may change a little if that ends up looking better. The goal for this project is to be my first submission to the site (with signatures of the others who did the initial work of course). Oh that explains why there's no new works in there. I had wondered bout that but assumed most spriters had left and lost interest. About Link I'll keep that in mind and see what I can do about an extra Navi or even Tael palette lel. EDIT: Wait...isn't Tael a guy? Hmm no Tael for this sprite then. Well I've made some progress. Honestly reworking the spritesheet has been quite easy but deciding on palettes has been almost absurdly rough for the second row. With how the sprite is currently set up finding colors that look nice and fit what I want hasn't been easy, and I'm still not satisfied with what I have currently. Anyway here is another update. Suggestions to edits or color schemes are appreciated. As I currently have it the colors that work best for hair are natural hair or brightly colored hair. For the wings/dress cool colors (blue, green, purple, etc.) look best-remember the eyes also get color from there. Brown or gold/yellow should also look decent. Red, pink, and white don't fit well as dresses with the current structure, unfortunately. Or at least I couldn't work them well. 1. Fey or Fairy. I personally adore auburn hair, especially on ladies, and the redish color makes nice contrast with green. 2. Pixie. Well The idea was a punk fairy, but unnatural hair colors and dark colors in general aren't looking too awesome. Feeling kinda meh overall about this one, but it's not bad. The hair might be a little too pink. 3. Titania. Originally I wanted a blond, white dress angel here, but the dress has 5 shades and it's hard to keep white clean-looking with noticeably different shades. So i settled on the fairy queen. I like this one too. 4. Navi. It's been a bit of a battle finding blues that don't clash or mix too much. It's not perfect and I'm not happy with it currently. 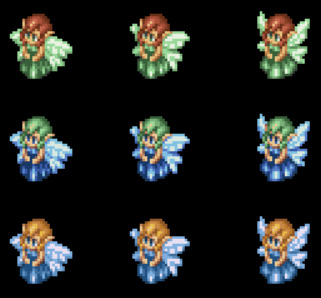 I feel a slight edit to the sprite overall would bring out the quality Navi deserves. Might be best to make her a unique spritesheet with this as a model. 5. Bubblegum. This was a happy accident I made while toiling through colors. I'm calling it Bubblegum because the classic pink and minty green. I only added the 4th and 5th palettes for the showcase, only 1-3 are really important, to be distinct and appealing. UPDATE: Forget all that jazz. I've made 3 improvements to the palette/design. Also i'm going to keep goin into depth over my palettes so interested persons can make easy changes, unless it's more annoying than helpful. I've replaced an excessive skin color with another highlight dedicated to the hair and eyes. Why is this important? Well it removes the skin tone from the hair, the wings color from the eyes, and provides a customizable color to accent the hair. Together these allow for much more dress and hair colors without bright pink on the face or peachy skin admidst raven hair. Here's the breakdown. 11-15 Wings/Dress (wings use 11-13 dress uses all. It's nice to note that 2. will no longer affect the dress either. I'm reworking the design slightly so that very bright color isn't involved. 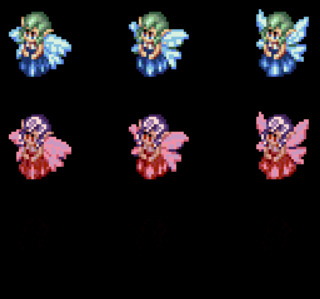 This will add some more distinction between the wings and dress and also makes darker colors (and the sprite in general) look better. Heres a sample of new sprite concept with improvements and various palettes. These palettes aren't final as i just threw together colors that looked underwhelming with the previous design. UPDATE: Glad to announce that I've mostly finished the spritesheet now. I noticed that the lower frames were essentially more poorly colored copies of previous frames (i improved them with the others of course). This is my first time working a monster sprite so I'm not 100% if it'll look good enough in-game. Some testing and critiques would be appreciated Besides that I'm not completely done, there are several changes left to make. 1. Redo the dead frames because they are garbage. Really just sloppy all around. 2. Possibly lengthen the hair in the back. Edit: possibly touch up the hair overall like i did with the dress. 3. Finish the portrait/improve it. 4. Finalize my personal palettes and matching portrait palettes. But most of the tedious work is done! Again I always value another's helpful input! The hair looks a bit pillowy. My suggestion would be to expand the lightest orange-tan color out a bit to fill more area, and to be less afraid of having a dark color touch a light one without a medium color between. The shiny highlight spot is probably fine how it is. The gown colors don't seem quite as pillowy/gradient shaded, and I think it may be due to higher contrast between the lights and darks, so you might try just brightening up the brights and darkening the darks in the hair. 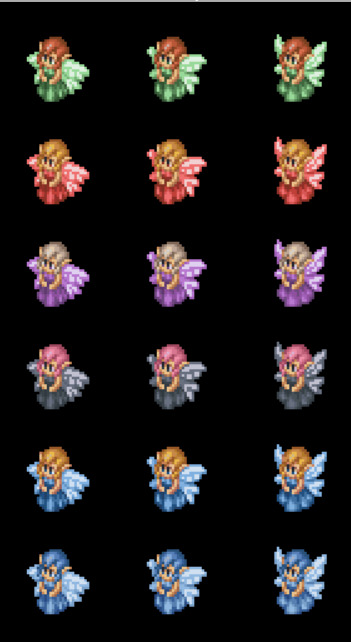 To clarify, its not really a bad looking sprite by any means, but it doesn't quite fit the same shading style as FFT classic sprites, which tend to favor wide areas of flat color that transition somewhat sharply into shaded regions, rather than transitioning smoothly. But that's really the only thing that jumps out at me. I totally agree that the hair is somehow...off. I'll fiddle with it and try your suggestion thanks! As for the dead pose would you guys think a revamped corpse (like now but better) or a mystical light orb would look better for a Fairy? And realizing my description probably wasn't very clear, I was thinking something like so.. with the light shade having a significant presence on the head. Working in such a small scale is always a challenge for getting detail or implication of detail across. 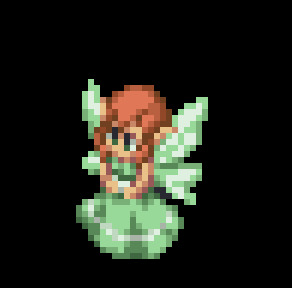 EDIT: maybe a scaled down fairy would look good for the dead pose? Like it was using magic to appear bigger or something? Its a curious question. Chocobos turn to feathers, bobcats turn to skulls.. what does a fairy turn into when it dies...? Maybe a leaf? or some kind of bellflower blossom? Oooh i really like the flower/leaf idea. I think that's very appropriate. 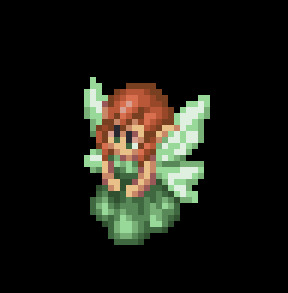 A tiny fairy would be hard to add any noticable details to, but it could also work. I'll try these later today, thanks! Took a look at the spritesheet in-game and I can see it has several more problems. Some frames aren't in the correct place, movement animations are flat and unchanging in some views. I looked for a breakdown of what each frame in a MON sprite is but couldn't find anything. Guess it'll be trial and error with referencing vanilla sprites to place them correctly and improve frames for animation quality. If someone does have a guide/tutorial to monster frames please share, otherwise I may make one after I figure them out, I've already picked up a few. EDIT: I guess one cool thing about needing extra work is i will get to do proportion, positioning, animation, frame work; which i really wanted more practice with. The flower looks great in-game btw Satoh. I'm not sure how to improve its design but I'll tweak it as necessary. EDIT 3: I took the liberty of finishing a diagram of the basic monster sprite frames for anyone else who might need help with this. Additional frames on a larger spritesheet would be for additional attack animations. From what i can tell Walk 1 is the base, standing pose. Walk 2 is partial-step (right leg left arm). Walk 3 is full-step (right leg left arm) Walk 4 is partial-step (left leg right arm) Walk 5 is full-step (left leg right arm). For creatures that don't use arms/legs to move be imaginative and remember right-side first, left second. Jump 2 is preparing to jump/crouching. Jump 1 is leaping through the air. *Note it seems the jumping animations are used for flying as well? * Block is blocking attacks. Dmge is taking damage/being hit. Lvl Up is leveling up. Criticl is near death (critical status). Dead is dead status, 0 hp. Attacks have 7 frames apparently, and Atk 1 isn't usually the standing pose, Walk 1, so they are each unique. Also each frame box is 48x48 pixels. If any of my observations are wrong please let me know! After a much longer than intended break (extended further by discovering neir automata) i got back into doing some work for this sprite again. I looked at some vanillas and you're right Satoh, they flow more than the blocky hair I had before. After reworking it myself several times I ended up using your example with tiny edits (hope you don't mind). I also decided to rework all the dresses. Here are my current concepts. 3. reworked dress and hair with added decor in place of a dedicated hair highlight. I like the third one, but I wonder how it will look with other palettes. The skirt looks greatly improved. I like the stripe because it adds some visual interest, but I'm not sure about the stripe under breast area. It looks like it might be conflicting with the shading some. But I like the revision. You made a definitely a huge improvement of the port that I made some years ago. I would love to see the sprite finished with these concept!